Burns Original recipe of Chicken & Brown Rice is a hypoallergenic food to satisfy the complete nutritional requirements of adult cats. 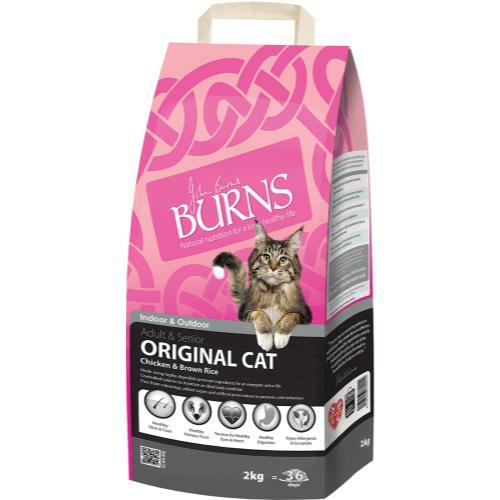 Naturally low in fat and free from artificial colours, flavours, and preservatives, Burns Original cat food is an excellent, high quality meal for healthy cats and an idea food for those with skin or tummy troubles. Loaded with essential amino acids and B Vitamins, Burns Original is a wheat free cat food made with quality chicken as a protein source and wholegrain rice for slow burning energy, with a carefully controlled mineral content for optimal kidney and urinary health. *Ash is a measure of mineral content, essential for pet health.